Hey, Disney Pixar Cars fans, your favorite Army Jeep has a cool, military themed story set! Drive in for tons of action and true to movie fun! 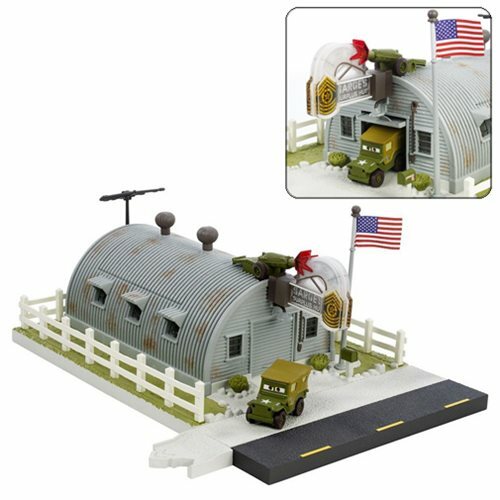 Sarge's collectors play set features authentic barracks with rich details, a roof top cannon, a light up sign for day and night play, a flag pole, and an exclusive Sarge vehicle! And that's not all: the barracks open up into a large play area where top secret Cars missions get hatched and built! Come on by Sarge's, soldier, for all your government surplus and active duty needs! Requires 3x "AA" batteries, which come included. Ages 14 and up.